SMARANEEYAM & COMVISION, our annual inter–school cultural is conducted successfully and enthusiastically. Students from various city schools participate in a variety of events. Sankara Model United Nations (SANMUN), a pioneer in the MUNs conducted by schools, is an annual inter-school event where students represent various countries in the different committees of the Model United Nations. This sees participation from students not only from schools in the city but also inter-state and international schools. This event hones the debating, diplomatic & negotiating skills of the students. 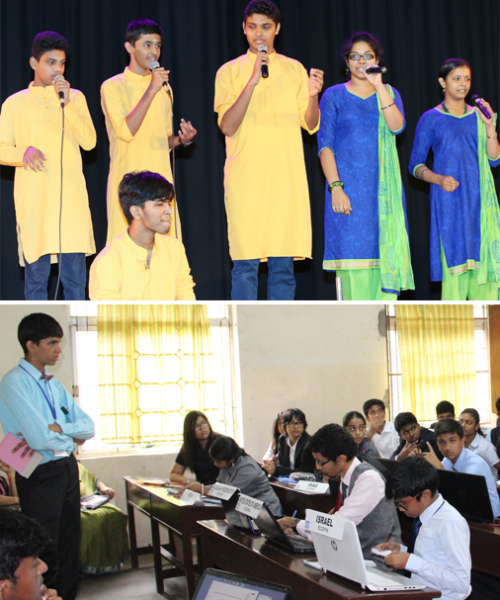 Various competitions are conducted for students named as Intra-School Culturals (Talent Fest) to develop and encourage their talents. News Letters are published twice a year bringing across various happenings in the school,prize winners of various competitions and other events. Thus parents and well wishers are informed about the achievements of the students. Project exhibitions are organized every year to bring forth the talents of students and develop the spirit of enquiry. 1 Bridge club: The school has initiated a bridge club for students from Std VI to IX. Bridge sessions will be conducted in association with Tamilnadu Bridge Association. 2 English Literary Club: The club conducts various activities like SpellBee, poetry recitation, debates, oratorical contests and literary quizzes. Drama Day is also celebrated every year. Students participate in the inter-school debates conducted by the ISDS and have a chance to represent India as a member of World School Debating Council. 3 Science Club: Seminars and presentations are conducted on a variety of topics to acquaint the students with scientific concepts in a fun manner. Quizzes and exhibitions are also organized to develop scientific curiosity in the students. 4 Maths Club: The club organizes regular guest lectures for the high school students. Written quizzes and Sudoku competitions are a few of the other activities conducted by club. A variety of hands-on activities are organized round the year in the Math lab for students to understand the practical applications of Mathematics in everyday life. 5 ACE Club: Accounts Commerce Economics club organizes annual exhibitions and guest lectures to create an awareness of various career options for Commerce students. Students are also given an opportunity to display their entrepreneurial skills during various school events. 6 Geography Club: The club organizes regular field trips to create an awareness of various topics. Written quizzes, model-making competitions and presentations are a few of the other activities conducted by the club. 7 Language Clubs: The Hindi, Sanskrit, Tamil and French Clubs conduct a variety of activities through the year like oratorical and essay contests, sloka chanting, gita chanting and Tirukkural recitation competitions. The French club also organizes regular exchange programme with schools in France. 8 Music Club: The club participates in various inter-school competitions and win a number of prizes and trophies every year. 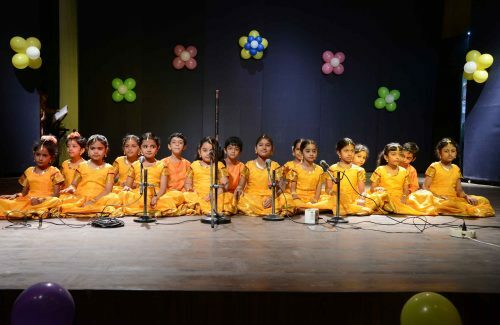 Students have also received the honour of performing in sabhas during the music season. 9 Interact Club: The Interact club functions under Rotary Club of Madras, District 3230. The club is active through the year, organizing activities like blood donation camps, the annual school carnival SANFEST, personality development programme and World Interact Week celebrations. The students also participate in the RYLA camp every year. 10 Gavel Club: The club is registered with the International Toastmasters Inc, which is an organization that helps develop public speaking skills. Students go through a ten-cycle programme towards certification from the International Toastmasters Inc. The club also organizes intra-club and inter-club speech contests regularly. 11 YI Club: The YI club functions under CII. The club inculcates civic responsibility in the students and helps regulate the traffic around the school during peak hours. The club collects e-waste regularly and ensure proper disposal. 12 Karuna club: Karuna Club is a part of Karuna International. The aim of the club is to instill in students a sense of compassion and responsibility. The club conducts various competitions like story-writing, painting, collage-making, essay writing and slogan writing. 13 Eco Club: Eco club being a part of WWF promotes clean and green environment. Students are involved in gardening activities and help in maintaining a herbal garden in the school. The club also organizes visits to ecological parks. 14 Scrabble club: The school has established a scrabble club, working with an alumnus who is an International Scrabble Master. The club works towards creating a better vocabulary by organizing weekly scrabble sessions. Our students also participate in state level tournament. 15 Heritage Club: Heritage club guided by INTACH, organises Model-making , film-making , essay competitions and awareness campaigns. The club organizes celebrations for various important days like Madras Day and Van Mahotsav Week to create awareness among the students on the heritage of the country. 16 Bala Jana Graha: The objective of this club is to inculcate civic awareness among the students through various activities. Students take part in state and national level competitions based on promotion of civic sense. In order to ensure an all-round development of the student’s personality, the school provides ample opportunities for the students to engage themselves in a variety of extra – curricular activities.